Every year, the number of bankers and traders employed by the largest banks on Wall Street shrinks a little. 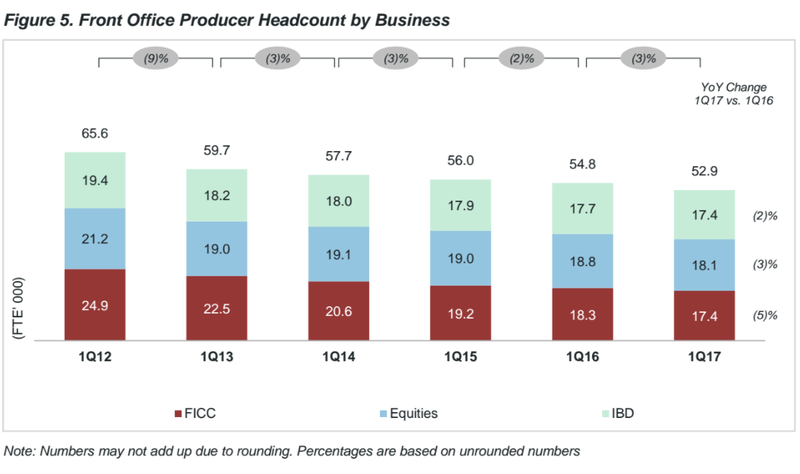 Headcount across investment banking, equities and fixed-income trading at the top 12 banks dropped by 1,900 from the first quarter of 2016 to the first quarter of 2017, a fall of 3%, according to new data from industry consultant Coalition. The data includes: Bank of America Merrill Lynch, Barclays, BNP Paribas, Citigroup, Credit Suisse, Deutsche Bank, Goldman Sachs, HSBC, JPMorgan, Morgan Stanley, Societe Generale and UBS.